I can say that I honestly underestimated the difficulty in the begining. At first I couldn’t go more than about 5 minutes at a time. 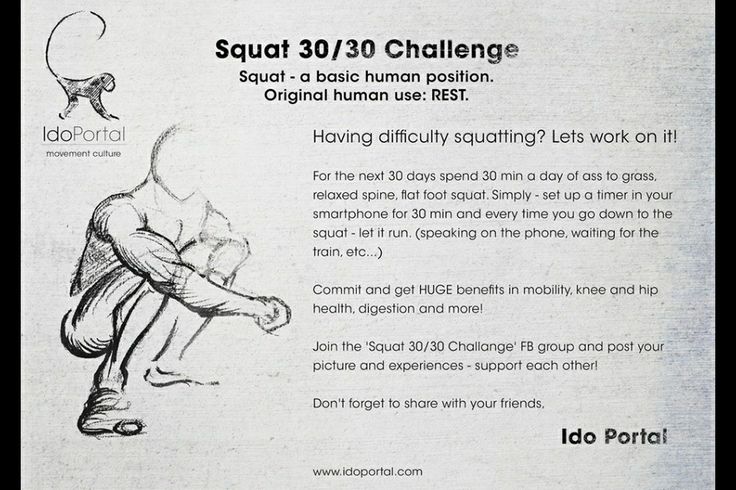 I’ve completed day 21 and now I can rest in the position for 16-17 minutes without stopping. To just sit and hold the position can be difficult if you need something to keep you busy there is a video. What I’ve found is that if you do the video. The video can keep you busy for about 20 of the 30 minutes. Then I’ll just watch tv or something for the last 10 minutes and try to really settle into the position. I’ve gotten to the point to where I can get my right heel down. Still working on the flexibility of the left side. Where do I feel soreness? Mostly my feet ankles and the back of my knees. I really feel it that first time you settle down into position. What I haven’t been doing is lifting. I’m excited to start lifting again as soon as my 30 days is up. I predict that I will see an increased explosiveness out of the bottom of the squat.